Every time I return to Bangalore it feels a little like returning home. My family and I lived at IISc in Bangalore for a year, back in 2008-09, and I came to think of its streets and sounds and smells as my home. I had the good fortune to return every January for six years (2010 through 2015), but hadn’t been back for four years. Although my visit was short – not quite three days – it was fun to walk the streets of the city and the paths of the campus and see what’s new. Read on. 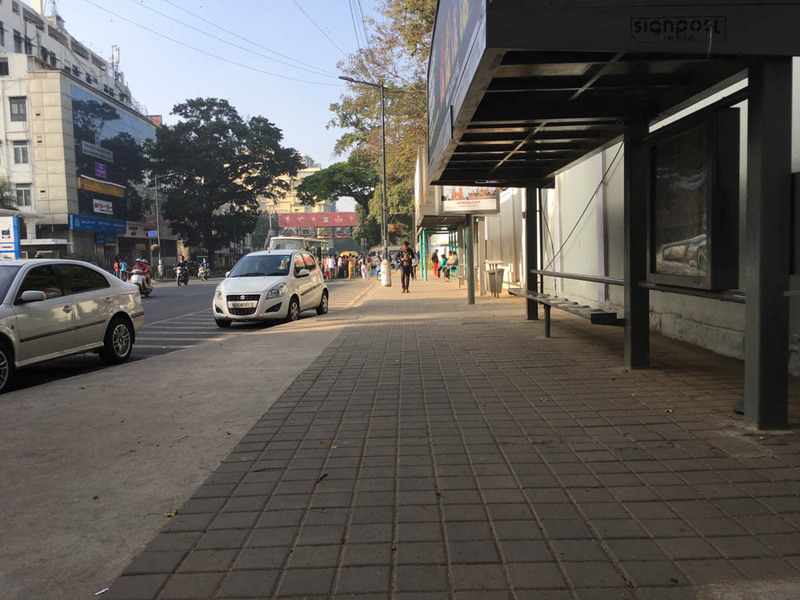 On this visit I was pleased to find fresh concrete sidewalks, patterned like cobbles, with strong steel pillars strategically placed to allow pedestrians to pass but to discourage Bangalore drivers from cheating the traffic by driving on the sidewalks (a practice I recall as common in 2009). During a visit to IISc, I noticed they are adding/upgrading sidewalks on campus as well. Below are some photos from the St.Marks and Residency Road area. St.Marks’ Road. 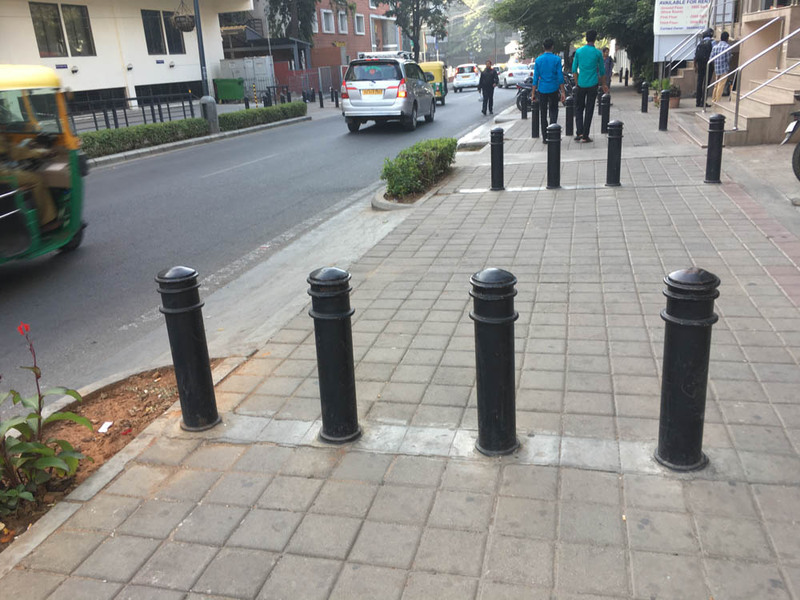 Notice the new sidewalks, with barrier posts to prevent people from driving on sidewalks. Residency Road. New sidewalks, swept daily by city workers. Residency Road. Notice the new sidewalks and bus kiosks. 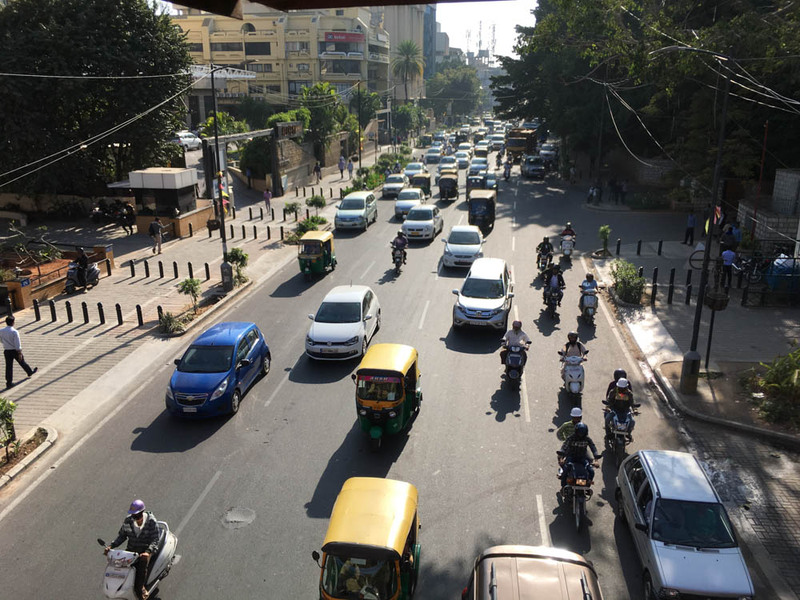 Bangalore traffic on Residency Road. Notice the new sidewalks, with barrier posts to prevent people from driving on sidewalks. I also noticed the city was cleaner – less trash. At least in the places I walked. 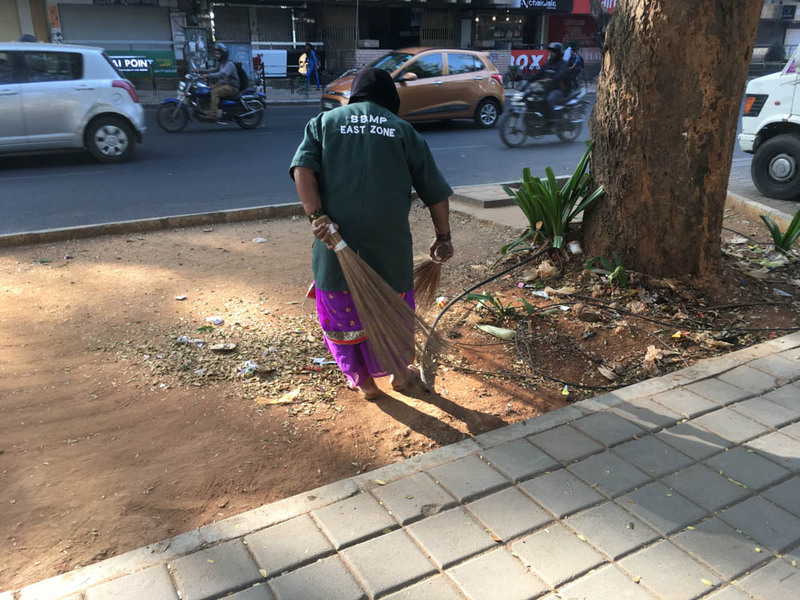 Perhaps it is because there are now new/more city workers to sweep the streets. Perhaps it is Modi’s cleanliness initiative. Who knows – but it makes a big difference! Finally, some of the metro lines are now open; there is a spiffy new station straddling the block between MG Road and Church Street, near Brigade Road. Next visit, I’ll have to give the metro a ride! Finally, on the IISc campus there is a new supermarket, mini-mall, and food court. A big improvement over the old stalls where we shopped, though I miss the staff we used to visit there every day. During my brief visit to the new shop, I had to pause on the steps and ask this monkey (rhesus macaque) for permission to pass. He had stuffed his mouth full and was chewing peacefully. I stepped right around him. All these photos and a few more in the gallery.